Linkin Park frontman Chester Bennington has died at the age of 41. The Los Angeles Times say that emergency serives were called to a private residence in Palos Verdes Estate in Los Angeles, California, regarding a cardiac arrest, with the report indicating the male victim had died of suicide by hanging. An investigation into Bennington’s death is now being carried out by the examiner’s office. 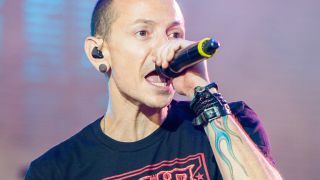 Bennington played in several bands in the 90s but it was Linkin Park’s 2000 debut album Hybrid Theory that catapulted him and his band mates into the limelight, with the record peaking at no.2 on the Billboard 200. Linkin Park released six more studio albums, their latest being One More Light which arrived in May this year. Bennington also sang with Stone Temple Pilots and appeared on 2013 EP High Rise. He left the band amicably in 2015 to concentrate on his work with Linkin Park. His death comes on what would have been late Soundgarden frontman Chris Cornell’s 53rd birthday, with Bennington writing a heartfelt tribute to his friend shortly after the news broke. Bennington is survived by his widow Talinda and six children – Jamie, Isaiah, Draven, Tyler Lee, Lily and Lila. Queen and Led Zeppelin star in the new issue of Classic Rock, out now!